Although camcorders can often baffle people with the myriad of features contained within them they all have 3 basic components – the lens, the imager and the recorder. In understanding the different tasks these 3 elements perform, it will give you more of an idea of how a camcorder works. It lets in the light that represents the image that you’re filming. On a standard camcorder bought on the high street, it automatically controls the amount of light which is allowed through via its aperture, features a zoom to adjust the field of vision and adjusts its shutter speed to capture the continuous motion. It is the imager which represents the ‘eye’ of the camcorder. Commonly referred to as the CCD (charge coupled device), it absorbs the light and gives it an electrical charge. The surface of the CCD is covered with millions of minute light sensors called pixels and it’s these which are charged by the light produced by the lens. The more light which comes in, the stronger the electrical charge and it’s the strength which determines the shade of grey which is produced. All the various shades of grey are then processed through colour filters in analogue format which is then converted into a digital signal by an A/D (analogue-to-digital) converter and then stored by the recorder. 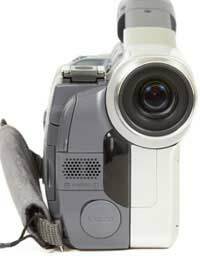 It is responsible for ‘writing’ the digital signal and storing it onto a recording platform which, in the case of the latest camcorders, is known as MPEG-4. ‘MPEG’ simply stands for ‘Moving Picture Experts Group’ which are the group of people who developed the technology and standards for video and audio encoding. MPEG-4 allows for ease of editing film and also facilitates the additional special effects which you can add in to your movie before the editing process begins, in other words – whilst you are actually filming. These can include widescreen recording, colour changes and tints, freeze-frame, strobe effects and fade out. These special effects can either be incorporated one at a time or mixed and matched. Once you have your MPEG-4 file, you can then edit it on a PC (in much the same fashion as you can store and edit a Word document) and can convert it into DVD format so that the edited and final version of your film can be played in any DVD player. Alternatively, the MPEG-4 can simply be downloaded onto an MP4 player and watched that way. This technology has been utilised very successfully for downloading podcasts from the internet to be viewed on an MP4 player whilst you’re out and about. One of its most successful applications is for allowing people to access news programmes whilst they’re on the move – a prime example being BBC Breakfast News’ podcast which is a brief edited version of the news highlights of the programme which can be downloaded whilst the programme is still on air and can be watched whilst you’re travelling to work on a train, for example. Many of the latest mobile phones also carry MPEG-4 capabilities nowadays too. It simply allows you to watch audiovisual recordings when and where you want. So, whilst the MPEG-4 is currently the camcorder manufacturer’s preferred mode of recording, no doubt further technological advancements in the future will mean that it will be superseded by another technology one day.